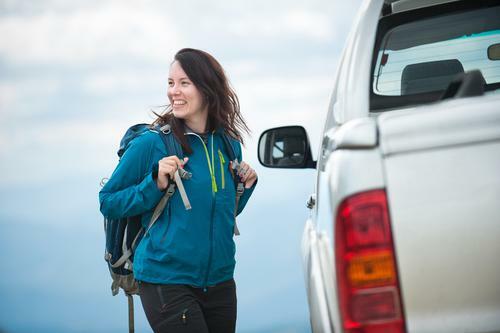 Women who are into off-road sports often have a hard time finding gear and equipment to suit them. That's because female riding gear is usually limited in size, style and overall utility. In particular, a lot of the gear aimed at women seems to be designed around the belief that all females are a size 4 (or smaller) and are exclusively fond of either animal prints or shades of hot pink that can be seen from outer space. Indeed, that's certainly not the case for everyone. Serious off-roadsters need serious gear, not camouflage makeup bags. For ladies looking for great gear that's practical yet versatile and sleek, here are four items you absolutely need when the call of the wild takes you out of the city and off the beaten path. The first thing all off-road truckers need is the right tires to get them from paved roads to untrodden paths. But this isn't a one-size-fits-all proposition. Motorists need to first determine whether all-terrain or all-season tires are most appropriate for their off-roading vehicle. Now, all-season tires are great for light wintery conditions and city driving, while all-terrain tires are ideal for handling tough winter conditions. Moreover, motorists who spend about 50 percent of their time driving off road should go with a set of all-terrain tires, although the frequency with which they go off-roading shouldn't be the only consideration when deciding. The severity of the terrain on which they'll be driving is a factor, too. Thus, if you take only one off-road trip annually, but that excursion involves demanding conditions and terrain, selecting a set of all-terrain tires would ensure you don't experience any problems. Whether you're commanding a truck or ATV through steep rock or deep sand, the wise off-roadster knows to reduce the air pressure in their tires in order to increase traction. Tires usually sit at around 30 psi and need to drop below 15 psi while off-roading. Since this process can be time-consuming, carrying a deflator in your vehicle will allow you more time to enjoy the great outdoors. For example, products like the ARB E-Z Deflator screw onto the valve stem, allowing you to remove the valve core that forces the air out quickly. With this tool in your arsenal, airing down becomes precise, simple and fast. Moreover, you can use the deflator as a pressure gauge as you go on about your merry way. Despite the widespread misconception about what a lady should wear while off-roading, a few designers have gotten it right. Women riders need gear that won't tear easily and that functions in all temperatures and products like the Savanna pant take this into consideration. Created after surveying women who go off-roading and ride trails, this garment was designed with vents throughout the legs, so they stay warm when the vents are zipped but still allow airflow during hot riding days. They're utilitarian but look sweet. Oh, and they come in colors other than fuschia. If you're off-roading, sooner or later, you'll deal with a blowout. But, contrary to what some believe, women can change their own flat tires. Now, the tire jack that came standard with your 4X4 makes that a bit difficult. Don't fret, though. Conversely, a high-lift jack is taller and can serve as a hand winch, clamper or spreader. It lifts higher, which is perfect if you're stuck in deep sand but can still lift the truck from the wheel instead of having to find a stable spot in the frame or bumper. Indeed, it's an essential tool in the 4WD tool box. Women more concerned with having an amazing off-road experience than they are with how their hair looks while out in the rough need the right gear to ensure their safety, performance and comfort. By adding these and other essential off-road necessities to your arsenal, you'll prove that girls do it better.